What new wireless .ac cards work with the latest rolling Kali release (4.14)? As of February 6th, you can download or upgrade to the latest rolling release of Kali Linux 2018.1. Here’s a quick run down of what to do to ensure your gear is working for your next wireless penetration test. No wireless cards only a few routers can be used packet injection. The Realtek Chipset based wireless USB cards are now commonplace, like the evil looking Alfa AC1200 & AC1900 WiFi adapters which are currently sold on Amazon. They support 5 GHz as well, but dependent on versions and the Realtek chip set aren't consistent at this time due to driver issues. Cards like like the Ralink MediaTek RT3572 Chipset based cards work out the box and have solid driver support, but have their issues as well. Performs passive and offensives discovery and attack modes for both 2.4 and 5 GHz bands. Works out the box for Kali 4.14 and supports injection. Out of 3 cards tested so far with the latest Kali rolling release the only one that work out the box is the AWUS052NH in the 5GHz world. Any other card you’re dealing with an unstable and not finalized driver. Your mileage will vary depending on your version of Kali. If you like rolling updates, then buyer beware. You have to set the monitor mode manually on the AWUS036ACH & AWUS1900 cards at this time. Ensure you installed the requirements and/or manually install the drivers. Ensure your card is now working in monitor mode. I like to make sure the card is working with the aircrack-ng suite installed by default before I install the latest kismet. I usually do this for passive recon before I start testing offensively. 10:09:24 Trying broadcast probe requests.. Installation instructions taken from kismet’s git page. This is my own Kali box above, shown working with a card in monitor mode and the web interface accessible locally. I really like the new UI web interface. 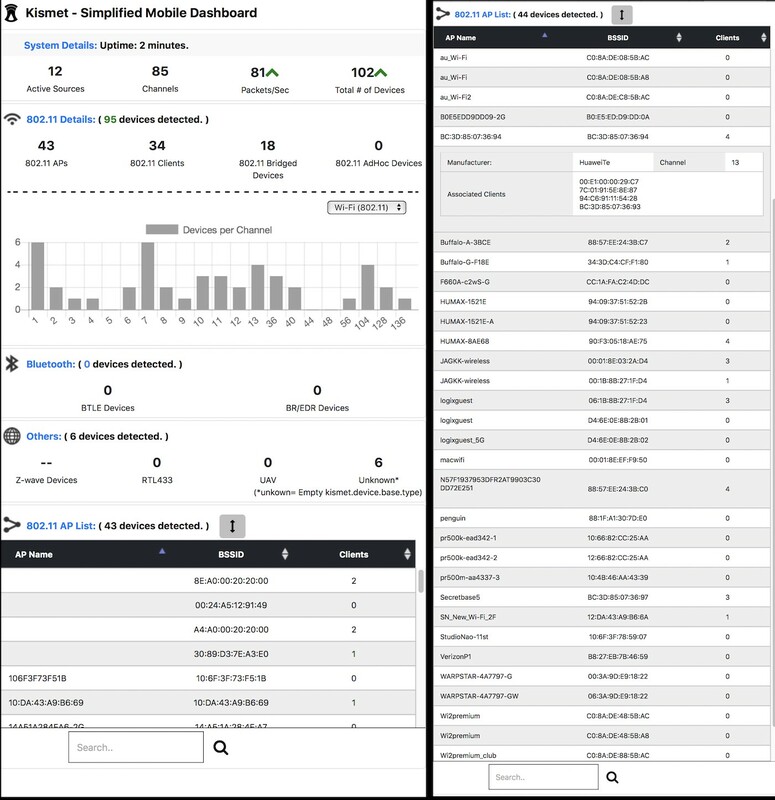 It’s great for interacting with your data, and with cool tools like the KismetMobileDashboard and the upcoming support for more software defined radios like the HackRF coming; Kismet has some awesome ways to interact with tons of useful AP and client info for WiFi and Bluetooth. Cool, so we should have a VM running Kali 4.14 with .ac support, and injection support for Part 2. This should give us a nice new working Kali install that’s a reproducible environment to test some newer attacks. Next time we’we’ll look at offensive wireless attacks that I’ve used on clients while performing wireless penetration testing for companies. Wireless attacks that I’ll describe have been used to breach some of the largest companies , from Fortune 5’s to small and medium businesses alike. How to convert the handshake to the right format, so we can brute force it with hashcat. We’ll also discuss in part 3 in detail about advanced wireless offensive attacks that not only lure clients to connect, but perform man-in-the-middle attacks and/or network attacks against the unsuspecting victims. Part 3 will take a deep dive into common offensive wireless attacks. Lets test the interface using native tools to rule out any channel, driver or aircrack-ng specific nuances with this version the Realtek 5 GHz compatible USB device, and the latest release of Kali. Remember we have lots of variables in the mix, so your mileage may vary depending on Operating System type and driver. -6000 — Re-authenticate very 6000 seconds. The long period also causes keep alive packets to be sent. -o 1 — Send only one set of packets at a time. Default is multiple and this confuses some APs. -q 10 — Send keep alive packets every 10 seconds. Let’s tie it all together, send some deuath packets to a client; and grab a 5 GHz 4 way handshake from an access point using WPA2-PSK. This is meant to supplement the aircrack-db test database for the newer Alfa cards,I’ve had a chance to test for injection in the 802.11.ac spectrum. phy0 wlan0  8814au  Realtek Semiconductor Corp.